Cyber security should be a familiar term – especially if you’re responsible for running a business or have any involvement in handling information within a business. That covers everyone from the CEO to the customer service agent that needs to access and distribute account information. It’s so important now to realise that cyber security is no longer just the province of IT nerds, but the responsibility of everyone. Cyber Security: The practice of building, and maintaining the protection of your networks, devices, or data from cyber attack. It doesn’t even come close to encompassing the full breadth of what cyber security truly entails. 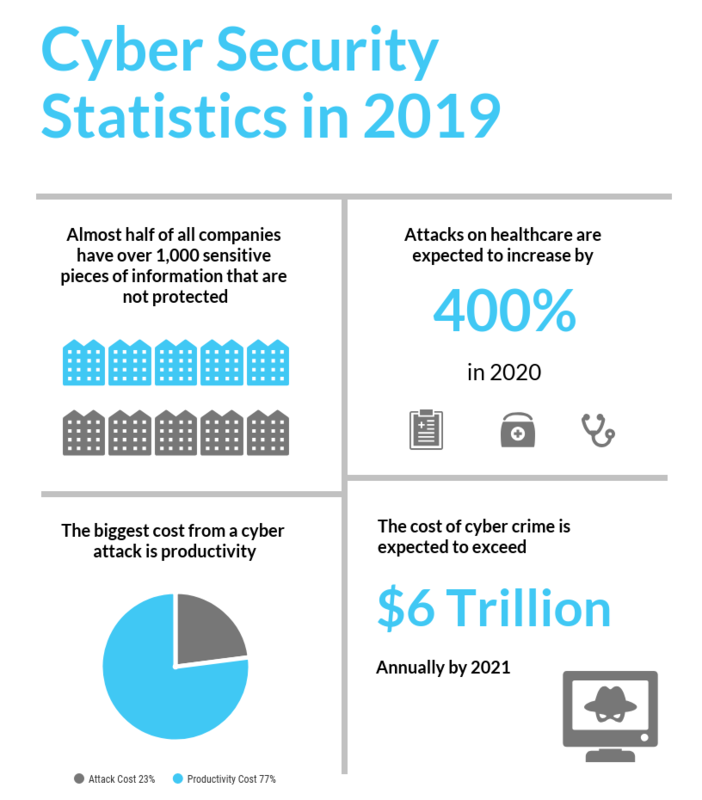 Cyber security covers a range of security factors from information management, to network architecture, to identity management, multi-factor authentication, scheduled backups, firewalls and mobile device management. And that’s just the tip of the proverbial iceberg. The biggest challenge in cyber security is that new risks and methods of attack arise literally all the time. How can you defend your system and information from brand new attacks that evolve overnight? So, it becomes a bit of a race. A security patch for every new vulnerability, evolving firewall technology, AI-driven anti-malware software! Due to the constant evolution of attacks and risks, cyber security simply can’t be a matter of set and forget. It requires constant maintenance, constant updating and growth. It sounds a little bit daunting, that’s for sure. Overall, cyber security means you can’t just rely on Windows Defender to catch everything for you. It means controlling physical access to hardware and systems, not just network access. It’s understanding the nature of attacks, and implementing a security framework. Furthermore, it can come down to the smallest thing, such as remembering to lock your desktop when stepping away, or double-checking who the sensitive files are being sent to. As a result, cyber security falls into the hands of everyone within an organisation. Cyber security has existed in some form or another as long as computers, networks and the Internet have been around. We’ve always recognised the need to protect our data, much in the same way attackers have recognised opportunities to steal said data. In this advancing technological age, cyber security is increasingly critical and relevant. We have smart devices galore, and cloud services holding all of our data. The Internet of Things has our fridges talking to our cars, and our phones talking to our TVs. Without cyber security, we subject ourselves to attack; compromising critical information, or crashing critical systems. Many businesses are now conducted entirely in the digital sphere. This means financial transactions, identity management and life-saving data are all subject to attack. Our society has more or less progressed to managing our entire lives online in some form or another. Consequently, the need for high level cyber security is greater than ever. With smart devices in every home and office, and many of those devices being used in BYOD work policies (Bring Your Own Device), the risk of cyber attack or incident is higher than ever. Statistics show the increase in cyber attacks, and Australian businesses are taking the fall for not being prepared. Cyber crime has grown at an enormously fast rate in the last few years and continues to grow. This is partly due to the difficulty in policing cyber criminals, and the enticing financial gain to be had. The Australian Cyber Security Centre (ACSC) stated in their Threat Report that they had identified 47,000 cyber incidents over the previous financial year, marking a significant increase in cyber crime in one year alone. Most importantly, 56% of all reported cyber incidents in the private sector were due to a compromised system. When we think of cyber security and data breaches, we think of some basement-dwelling troll hacking into our system, but lets acknowledge the biggest cause of data breaches shall we? Human error. Whether its a trusted insider, a third-party contractor, or vendor, there are always additional users with access to your data. These people are not infallible and need to understand the seriousness of following cyber security protocol. Read Here for The Top Ways to Become a Cyber Resilient Business. Getting hit by a cyber attack is a big blow to any business, but moreso for small and medium size organisations. Dealing with any cyber incident (be it accidental data breach, or malicious attack) will mean several things. There will be a real financial cost in the wake of the incident, and it’s likely your reputation will also take a hit once word gets out about the attack. The following days and weeks will see continuity and productivity grind to a halt as you try to navigate your recovery. Let’s break down the different ways in which your business is impacted by a cyber attack. Instigate an investigation to locate the source and scope of the breach. Employ an IT security consultant to perform a security audit (in order to identify vulnerabilities). Associated PR and legal costs in order to manage company image, and time lost to notifying authorities and clients. Staff are taken away from their regular duties in order to handle inquiries and ongoing management of the breach. Employ an IT services team to reinforce your security perimeter, and implement solutions to address any vulnerabilities. Loss of clients and associated revenue due to breach of trust. All of these steps ultimately incur a significant financial penalty that are all a direct result of the data breach. With any system breach, you risk breaking your carefully crafted public image. You have to send that sheepish email notifying your client base that their private data has been stolen. Their private, financial, personally identifying information that is. They trusted you! And now their information is compromised. You can take every step at that point to turn your system into Fort Knox, but the damage has been done. The trust is broken, and it doesn’t really matter if you couldn’t prevent it. You’ll need to pour a significant amount of time and money into this disaster in order to recover your reputation. You should think of your data as a shoebox full of embarrassing photos and love notes from your teenage years. Protect it at all costs, and never let its contents see the light of day. 74% of consumers said they would switch providers in the event of a breach. An obvious impact to take into account with any cyber attack is the loss of productivity. You will experience a significant drop in productivity, due to heavy disruptions in normal business activity. In order to determine the extent of the breach, you’re looking at halting sales, shipments, and performing ongoing investigations. Because of this time taken away from the business, you now have a significant loss in productivity and momentum. Not to mention lost profits during this time as well. Once you factor in the ramp up back to optimal productivity, you’re looking at a critical impact on your business. There are a number of ways in which a business can be vulnerable to cyber attack. This is a little technical, but it can definitely be beneficial to understand the ways in which data can be exposed. A fuller understanding of the cyber security environment gives you a better ability to manage risks. A cyber vulnerability is where you have the intersection of three factors. A weakness in the system. The attacker’s access to said weakness. The attacker’s ability to exploit it. An injection vulnerability can occur in any application that allows a query input that communicates with a back-end database. SQL is probably the most common example of this. This essentially allows the attacker to bypass the intended function of the application, and execute a malicious query. Using the SQL example, the attacker can input a malicious command that alters the path of execution. This can cause the program to retrieve and dump sensitive data into unauthorised hands. A buffer overflow vulnerability is a common weakness that is frequently present in operating system code. While buffer space and memory layout is generally well-defined, sometimes anomalies occur where you have too much data input. This causes the buffer space to ‘overflow’. It is in this overflow space that an attacker can enter malicious executable code and potentially gain access. This one is a little more self-explanatory. Sensitive Data Exposure occurs when an application does not sufficiently protect sensitive information from being disclosed to attackers. 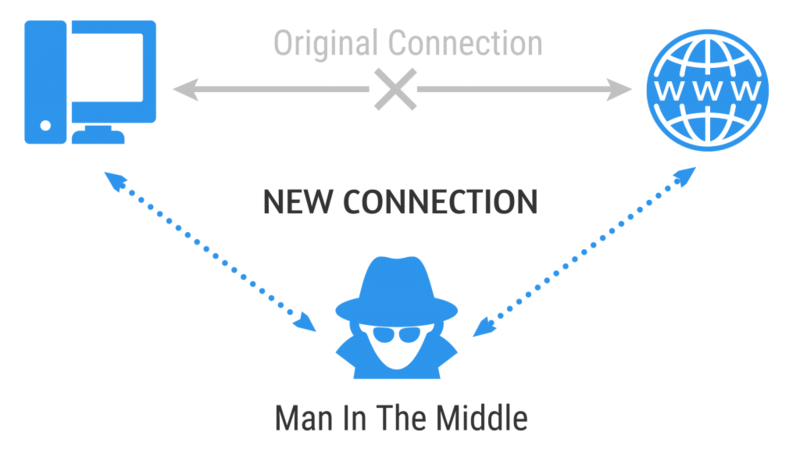 The attacker could, for example, intercept the data between a server and a browser. This is creatively known as a Man-In-The-Middle attack. The biggest cause of this weakness is a lack of encryption, weak key generation and algorithms. This type of flaw is difficult to eliminate due to the variety and number of authentication methods. Each user can employ different methods, and there are multiple ways an attacker can bypass these mechanisms. They could for example, use the aforementioned injection attack to retrieve a session identifier, or reuse an old session token. With that, they could access your online banking, because they’ve tricked the server into thinking you never logged out. Yikes. This type of flaw is possibly the most common and dangerous of all. Some examples include: running outdated software, applications running in debug mode, running unnecessary services on the system, not changing factory settings (e.g default passwords), and incorrect exception management that allows system information to be disclosed to attackers. Thanks to some ethically-dubious products on the market, an attacker is easily able to identify systems that are not properly configured. Now that we’ve covered the common type of cyber vulnerabilities, the next issue is, how do you identify them? How do you assess if you are exposed in this way? Luckily, there are software tools created for exactly this purpose (thank you Symantec, Trend Micro, and NetIQ amongst others). But bear in mind that it’s unwise to simply rely on a piece of software to handle all your risk assessment for you. A truly thorough risk assessment should involve a comprehensive protocol alongside specialised software. This software doesn’t just identify, but also analyses, evaluates and manages all vulnerabilities in a structured manner. The best thing you can always do for yourself and your business is to be involved, regardless of your current cyber security status. You need to learn about and understand the current state of security. Take part in actively screening potential vendors or third-parties, and be engaged with the whole process of protecting your business. Follow these simple steps to get a good understanding on your organisation’s cyber security. you address your vulnerable points, you’ve already done the important part. Malware is somewhat of an umbrella term that includes trojans, worms, spyware, ransomware and viruses. Its basically defined as a malicious code or software with the intent to corrupt or steal something on your system. Malware usually gets introduced to the system through an email attachment or an unsafe download. Sometimes its attached to a frequently used and trusted website so you’ll allow the malware through your anti-virus software. DDoS is an attack that focuses on disrupting service to your network. Attackers send high volumes of traffic through the network until it becomes too congested and can no longer function. 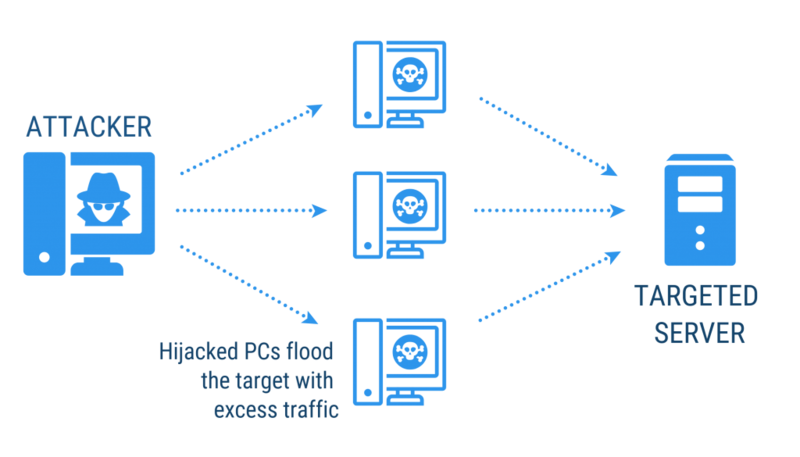 Attackers often use multiple computers to send the traffic or data; hence distributed. Users often won’t even realise that their computer has been hijacked to participate in a DDoS attack. These attacks primarily target huge companies, often in protest towards governments or individuals. Phishing attacks are almost always sent by email. They’ll appear to be a trusted source that will ask you to click a link and enter some personal information. It could be posing as your bank, and asking you to ‘verify’ your password by clicking on a link. These are usually pretty easy to spot, but they have definitely grown more sophisticated in recent years. They can closely resemble official emails from parties like Apple or Paypal. A tried and true method for avoiding these traps is to remember that your bank or any other trusted site will never make such requests via email. Read Here For Clear Ways To Identify Phishing Attacks. This type of malware is self-explanatory. Ransomware is a type of malicious software that will effectively hold the victim’s data hostage in exchange for a ransom. Your data becomes encrypted and completely inaccessible without the decryption key. The attacker will usually threaten to completely destroy the data if their ransom demands are not met. Most perpetrators are not prosecuted, since ransoms are almost always paid in cryptocurrency (which is nearly impossible to trace). Ransomware attacks are typically carried out by exploiting a vulnerability with a trojan. The brute force attack can also be called a password attack. The brute force attack is fairly self-explanatory in nature. Previous methods attempt to trick the user into allowing the malware through, or find a backdoor into the system. However, the brute force method employs an algorithm or software that will literally try to deduce the password. The algorithm will run thousands of word and number combinations, sometimes even comparing against a dictionary for potential words. Hence, it’s so important to create a strong password, including upper and lower-case letters, numbers, and symbols, as well as change it on a regular basis. Rogue software is another type of malware, but has a key difference that is important to note. It will disguise itself as critical security software that will keep your system safe. They create legitimate looking pop-ups and alerts, often masquerading as updates to existing security software, or terms of service agreements. Through these pop-ups users are tricked into allowing the software to access their system. We briefly mentioned this one earlier when discussing Sensitive Data Exposure. The way this works is by impersonating the endpoints in an online data exchange. From your computer to your online banking website, for example. The ‘man in the middle’ impersonates the bank to communicate with you, while also impersonating you to communicate with the bank. Therefore they receive all the information traveling between the two and gain access to sensitive information. Use an encrypted wireless access point, and always look for a HTTPS connection. Take these simple precautions, and you are less likely to be targeted by this attack. This is a strategy for delivering malware in which the victim is a particular group (like an organisation or an industry). Watering Hole attacks happen when the attacker targets a website or websites that are frequently used by members of the group. They infect these websites with malware as a trap. Eventually, a member of the group will fall prey to the malware and from there gain access to the whole network. Given the large number or users exposed to the infected site, this type of attack is extremely difficult to trace. Not even our beloved Facebook is safe from cybercrime. Now social media platforms like Facebook, Twitter, or LinkedIn are being used to deliver cyber attacks. They often achieve this by exploiting broken authentication and stealing login credentials, or phishing attacks. Once logged into Facebook, you could receive a download link, or a rogue friend request and you should absolutely be wary. Users must take extra caution due to the fact that Facebook is integrated so thoroughly into all aspects of online life. It’s incredibly common to use your Facebook login for an infinite number of sites and apps, so giving up your social media security could mean so much more than just access to your friends’ list. Unpatched applications and programs present a real vulnerability that can be exploited for attack. Consider browser add-ons and programs like Adobe Reader or Flash. You frequently use these to make your online experience smoother, without so much as a second thought. These programs often have regular updates, so it’s important to ensure you apply them to reduce your risk of attack. Check out The 5 Most Common Cyber Security Threats. The downside of having multiple passwords that fit the requirement of being long, complex and random is that it becomes incredibly difficult to remember them all. Enter: the password manager! A password manager stores your passwords securely by encrypting them and offers the ability to share them safely. When you want to disable their access, you can do so without needing to change the password. Have a look at password tools like LastPass or Dashlane. A next-gen firewall is part of the third generation of firewall technology, meaning it combines traditional firewall with more sophisticated functionalities for detecting and preventing intrusion. They generally include anti-malware and anti-virus that are continually upgraded as new threats are discovered. FortiNet and Cisco are both amongst the top NGFW tools on the market. Regularly evaluate your system and ensure that your staff only have access to the data and networks that they actually require to perform their job. The less people you have exposed to sensitive data, the less likely that such data is going to be compromised (either intentionally or accidentally). These malware detection programs use clever algorithms to immediately detect and contain any malware, often detecting intrusions before they take effect. There is some debate on whether it’s really AI, or just advanced machine learning, but the end result is the same — an anti-malware program that handles threats before you’re even aware of them. Just avoid the one called Skynet. Check out tools like BitDefender and Cylance. Performing a vulnerability scan of your entire infrastructure will help to highlight any security weaknesses in your system. You can do it yourself as an individual using an entry-level scanner tool, or employ an IT expert who can use a more sophisticated enterprise-level product. We discussed this briefly above in more detail, but if you want to review some scanning tools, check out Qualys, Detectify and Nessus. A cyber security audit should give you a clear idea of your problem areas and what issues you need to deal with regarding your information security. There are audit questionnaires you can use yourself to get an idea of where you stand. Or you can opt to take your business to an IT company that specialises in cyber security and ask them to take your security to the next level. We’ll review this further below. 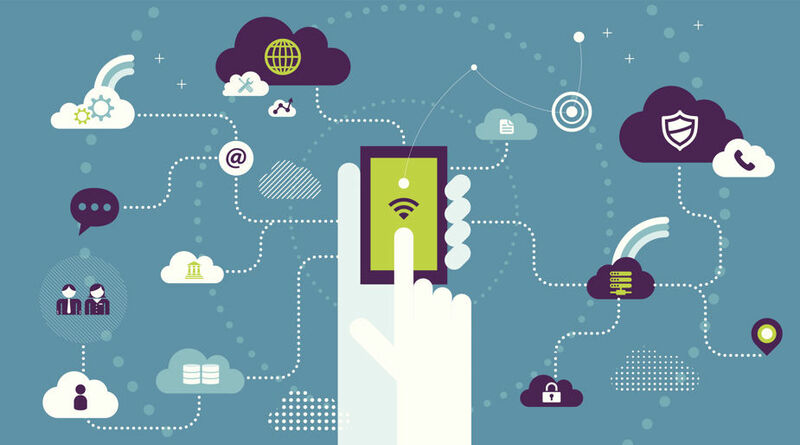 Implement a mobile device management solution within your business. There are numerous MDM tools you can use, and many have their pros and cons — but ultimately they work to secure your company data, and your employee’s personal information. A good MDM tool allows you to provide your staff with access to business apps and data on mobile devices without requiring individual device enrolment. Compare the MDM Tools on the market HERE. All your devices should be encrypted — this means computers, mobile devices, hard drives and storage. Encrypting the devices means that your data is incomprehensible without a key. Basically, if someone gets access to your laptop or mobile, they can easily access files and data without encryption. If encrypted, your files are still protected in such an instance. A VLAN is a group of devices that appear to be on the same local network despite their physical distribution. Hence the name “virtual local area network”. This drastically improves the security of such a network. VLANs also allow you to virtually segment devices or departments on different networks to improve security — you may have heard it referred to as ‘network segmentation’. As long as you have a VLAN-capable switch, you can do this. Make sure to conduct regular evaluations of who has permission to different systems in your network. This includes systems that have been opened with APIs. Due to staff turnover or evolving roles, permissions should be periodically updated and reviewed. Control removable storage media and connected devices, which can easily carry or transmit malware to an unsuspecting or unprepared computer. Don’t allow anyone to just bring in their thumb drives willy-nilly! You can even disable drives so employees aren’t able to put information on removable media. Use your firewall to set up web content filtering. The filter works by identifying the origin or content of a web page based on rules you have defined. This can help you avoid visiting malicious pages. Content Filtering will significantly improve your security by blocking access to malicious or risky websites, utilise your policy-based controls and prevents malware download. Set up a WiFi specifically for guests that is separate from the one you use for work. The guest WiFi should have no access to your internal networks, so this way your guests have internet access but not access to your data. 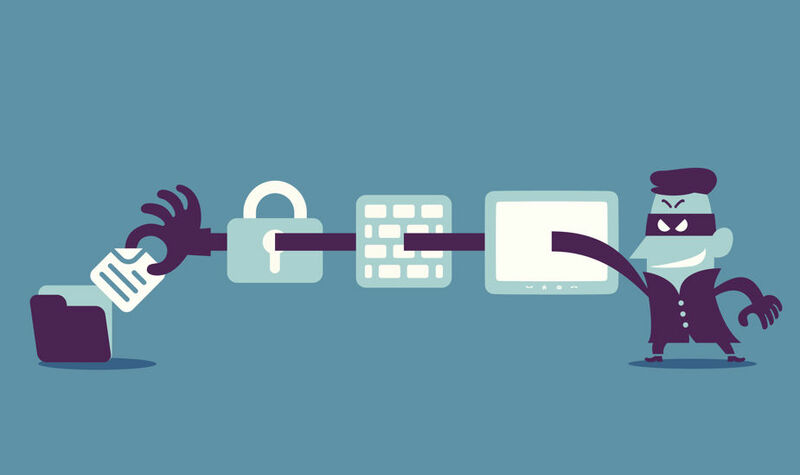 Using a VPN is a simple but thoroughly reliable security measure. It protects your network from being exposed to the network, or other unsafe networks by encrypting your information and providing a secure network of communication. You can set up a VPN software on Windows or your Mac OS. Alternatively, you can use your existing security solution such as FortiGate. Identity management is all about defining and managing the roles and privileges of your individual users on the network. How do you define who can access what? Have you separated customer identities from employee identities. Each individual should have one identity — this way you can monitor activity and immediately identify who performed what action. An incident response plan gives your team a set of steps to follow to manage and mitigate any data breaches or other incidents. Tailor the response plan for data breaches and information security. If you’ve got a framework implemented, then it should also provide an incident response plan for you to follow. With a cyber security monitoring system implemented, you’ll be able to consistently monitor critical systems and data. With this you’ll be able to know straight away if there’s any suspicious activity or data breach. If you have a dedicated server room, ensure it’s locked whenever not in use, and clear policy about who has access to the key or code. Use rack mount servers as they are easier to secure. Any portable or vulnerable devices should be locked away. Shred or destroy unwanted printed documents that may contain sensitive information. Check our expanded list on security strategies here. Don’t stress if wording gets a bit technical here. We’ll try not to bog you down with too much jargon! There are set frameworks and guidelines in place you can follow to maintain cyber security compliance, like a checklist for hitting all the right steps to secure your network. The Australian Cyber Security Centre (ACSC) is a fairly new collaborative organisation the Australian Government has pieced together from existing federal agencies with the sole aim of bolstering the security of Australian networks. The ACSC has put out multiple documents outlining important cyber strategies and threats to watch out for, though their Cyber Strategy document refers to the overall Government strategy and action plan for strengthening Australian cyber security in general. 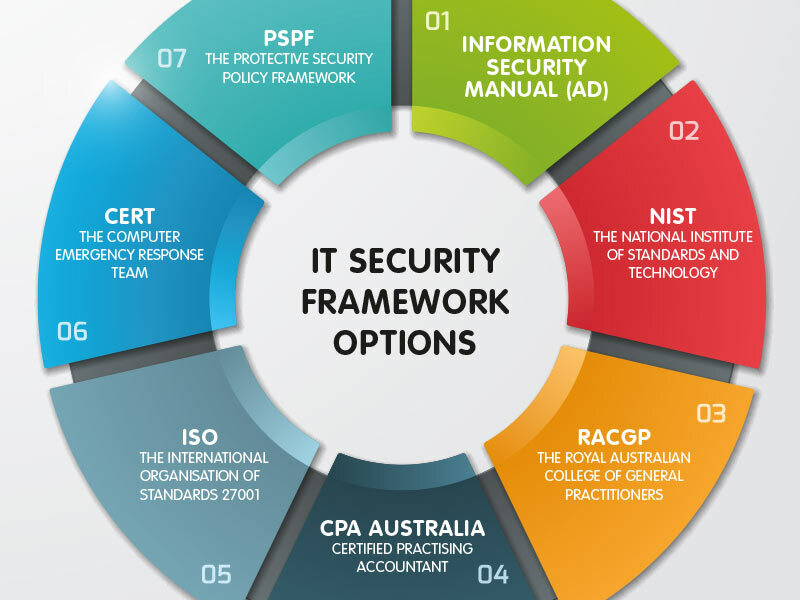 A Cyber Security Framework is a set of documented processes that are used to define policies and procedures around the implementation and ongoing management of information security. This manual is divided into multiple parts, but most of the relevant information for businesses is in Principles and Controls. This set of guidelines describes the compliance standards expected of Australian government agencies, but much of it is non-specific in its approach. Therefore, you can apply these guidelines to your private business or website as well. FIRST (Forum of Incident Response and Security Teams) is a collective organisation of response teams that handle computer security incidents and promote incident prevention programs. They have their own publication of standards, and a Best Practice Guide which details all the steps recommended to best protect your website from any incidents. FIRST contributes to external standards bodies like ISO, which lends a great deal of credibility to their organisation, and they have a clear layout of their own created standards that are easy to find and follow. NIST (National Institute of Standards and Technology) is a U.S. agency established to provide industry standardisation and measurement solutions. Their cyber security framework also adopts a risk-management approach, comprised of three parts. Between them all, these parts cover industry standards, guidelines, and cyber security activities. While this is a U.S. based framework, there is no reason the steps and guidelines in it cannot be useful to an Australian-based business. It’s no surprise that RACGP stands for none other than the Royal Australian College of General Practitioners. They have published a set of standards that are applicable to all general practices, and other office-based practices. This set of standards doesn’t only focus on risk assessment, but also managing availability of information. Furthermore, it covers backup processes, business continuity and recovery planning, and access management. CPA have published an array of articles and webinars focusing on the best ways to secure your information. Their document IT Checklist covers the whole range of topics on IT system management and cyber security. They focus on a similar approach to the ACSC’s ‘Essential Eight’ steps for security management. The International Organisation of Standards does seem to be the place to go when looking for cyber security standards. ISO 27001 focuses mainly on information security management systems. It’s an extremely detailed document covering all aspects of information security from establishing a management system, through implementation, maintenance and improvement. This ISO document advocates for the same holistic approach discussed earlier, where cyber security is a duty integrated into all aspects of an organisation. – Remote access protocol that can be implemented into your cyber security framework. – The top control systems tips that can be cheaply and easily implemented. This framework is a dedicated set of policies and protocols that provide guidance for protecting assets and information. This covers all types of security protocol, but they do have a dedicated document for information security management. This set of protocols was developed by the Australian government for governmental agencies but again, can provide the tools and guidelines that can be used by a private organisation. Review this framework here. 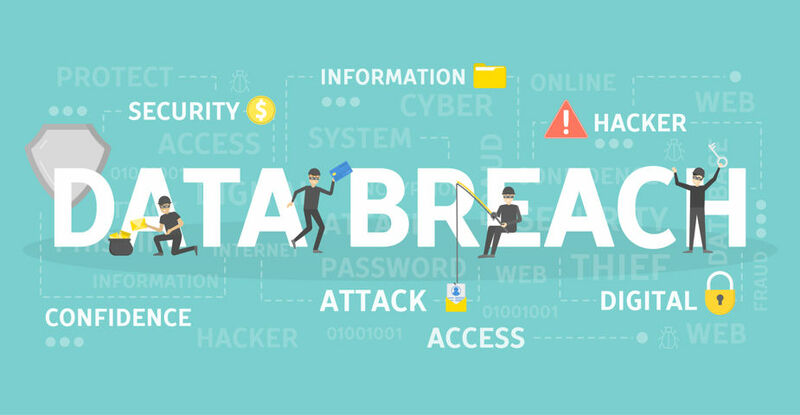 The Notifiable Data Breaches Scheme is a governmental legislation that only just came into effect on February 22, 2018. This scheme creates an obligation to notify individuals whose personal information is involved in a data breach that is likely to result in serious harm. This notification must also include recommendations about the steps individuals should take in response to the breach. The Australian Information Commissioner must also be notified of eligible data breaches. The NDB scheme applies to agencies and organisations that the Privacy Act requires to take steps to secure certain categories of personal information. Therefore this includes Australian Government agencies, businesses and not-for-profit organisations with an annual turnover of $3 million or more, credit reporting bodies, health service providers, and TFN recipients, among others. Check here if your organisation falls under this scheme. 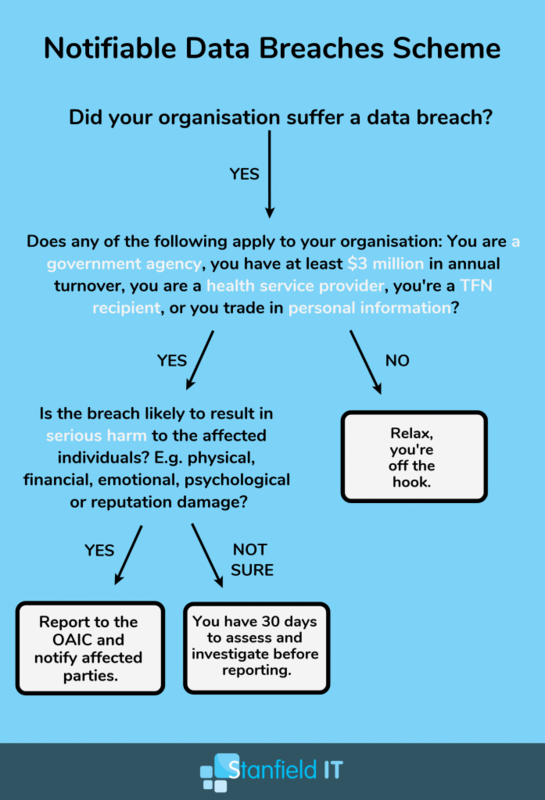 The NDB scheme only applies to data breaches involving personal information that are likely to result in serious harm to any individual affected. Refer to the OAIC website if you’re still unsure where you stand. So, let’s say the worst comes to pass, and despite all your best efforts to secure your information and networks, some malicious troll compromises your data. Enter: Cyber insurance. Cyber insurance can provide your business with an added layer of assurance in the case of a cyber incident. It can’t protect you from a cyber attack, but the insurance can cover many of the associated costs. Investigations, customer notification, credit monitoring, public relations, legal costs, compensation, loss of revenue and more. In order to find a fit for you and your organisation, investigate what risks are covered by the policy. One thing cyber insurance cannot do though, is recover the loss of intellectual property or prevent any reputation damage incurred as a result of a data breach. Cyber insurance is still a pretty new type of policy, so coverage and premiums are may not be flexible or diverse. Your best bet is still to minimise the risk of any incidents from the inside and hope you never actually need the insurance. PageUp is a medium-sized Australian company that provides a cloud-based HR management software, and currently serves clients all over the world. Recently they suffered a security breach and we have been able to watch this play out in almost real-time due to PageUp’s transparency and responsiveness. On May 23, PageUp detected unusual, unauthorised activity on their IT infrastructure, and immediately took the initiative to launch a forensic investigation. Their initial investigation revealed that a malicious code was executed within PageUp’s systems. PageUp’s response was to launch an investigation immediately with the assistance of a third-party cyber security organisation, as well as advise Australian regulatory bodies in keeping with the Notifiable Data Breaches Scheme. By May 28, they located indications that client data had been compromised. On June 5, the CEO released an announcement advising of the potential breach and ensuing investigation. PageUp was very proactive and forthcoming with information with all regulatory bodies, but most importantly, with their clients. PageUp continued to keep their clients and public informed with progress updates. On June 12, the CEO posted another update confirming that they had contained the breach and secured their site. The organisation advised that their site had no further threats and was safe to continue using. They also made sure to announce that some types of personal data had been accessed and listed specifically what information had been potentially compromised. Aside from launching a forensic investigation, PageUp contacted the Australian Cyber Security Centre (ACSC), the Australian Federal Police, and Australia’s Computer Emergency Response Team (CERT) to advise them of the incident and draw support. On June 17, they posted another update advising they have liaised with the Office of the Australian Information Commissioner (OAIC). PageUp offers steps and suggestions on what the individual can do from home to further insulate themselves from cyber risk, namely changing passwords, implementing multi-factor authentication, etc. This breach had a significant impact on PageUp. Many customers lost faith in the platform, and opted to cancel their contracts following the breach. Australia Post was one of the big-name clients who chose to sever their connection with PageUp and moved elsewhere for their recruitment solutions. PageUp was also forced to delay their ASX listing which was due to commence in 2018. There was also discussion of a class action lawsuit being launched against PageUp due to the breach.Overall they suffered real brand and reputation damage which translates into financial loss for their business. As of July 2018, the investigation is ongoing to determine the extent of the breach and which records were affected. On June 19, they shared another update; the ACSC, the Office of the Australian Information Commissioner and IDCare released a joint statement on the issue. On 21st November, their forensic expert confirmed there was no conclusive evidence to suggest data was taken in the incident. As a business with many high profile clients, including most of the ASX200 companies; it’s highly likely that PageUp already had a business continuity plan in place. They promptly sprung into action and opted for a route of transparency with their clients, as well as the public. However, it goes to show that despite the best laid plans, an unforeseen security incident such as this (ie. an attacker installed tools to steal data), clients still lost faith and some chose to take their business elsewhere. The financial and reputational damage to the business is severe. Overall, this incident demonstrates the need for a well-established response plan, and the need to have extensive preventative measures in place. Prove that you are committed to protecting your client information through transparency and communication (people love integrity). It shows that you are serious about cyber security and understand the negative impact that a data breach can have. Does your organisation have cyber security policies and procedures in place? Does your organisation protect all sensitive information transmissions (ie with encryption, SSL)? Are all devices protected from the internet by a firewall? Does your organisation have designated cyber security personnel and/or a cyber incident response team? 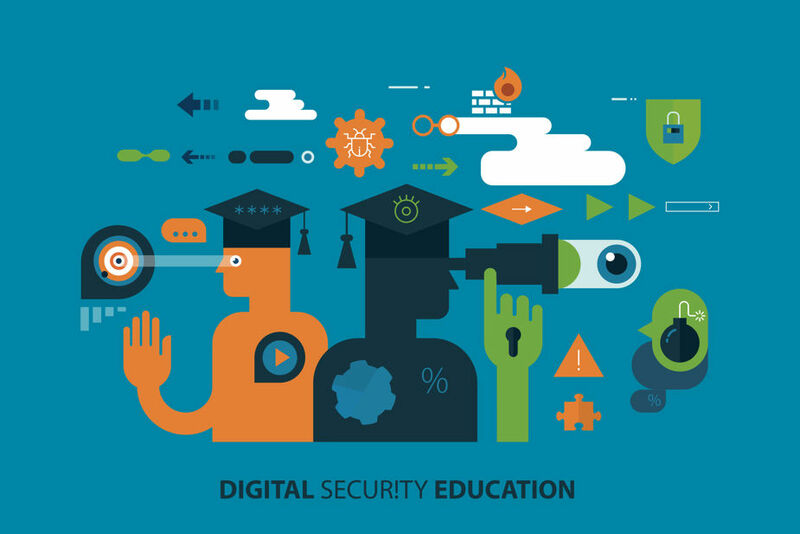 Does your organisation have a cyber security user education and awareness program? Do you perform cyber security audits annually? Are all users with access to devices containing or processing sensitive information required to use a unique username and complex password to access these systems? Do all devices with access to sensitive information get scanned for vulnerabilities on a regular basis? Are all laptop and mobile devices encrypted and password protected? Do all mobile devices with access to sensitive information have mobile device management with the ability to remotely wipe the device? Does your organisation require two-factor authentication for remote access? Does your organisation have a Business Continuity Plan, and if so, does it include back up and recovery procedures for all virtual systems? Are all administrative accounts only permitted to perform administrator activity, with no access to internet or external email? Cover these steps, and you’ve covered the essentials. Of course, this is not all you need to protect your business. Make time in your schedule to further analyse and audit your systems regularly, and follow the investigative steps we listed earlier to make sure you’ve got all your bases covered. ACORN is a national policing initiative of the Commonwealth, State and Territory governments. It is a national online system that allows the public to securely report instances of cybercrime. IDCare is a not-for-profit Australian charity that addresses a critical support gap for individuals confronting identity and cyber security concerns. An important Australian Government initiative to ensure that Australian networks are amongst the hardest in the world to compromise. A new service that combines ASD and CERT services, all being delivered by the ACSC. This consolidated site will eventually supercede ACSC and ASD related pages. An intelligence agency in the Australian Government Department of Defence with a focus on information security. CERT is the primary government contact point for major Australian businesses to receive and respond to cyber security incident reports.